Wow, what an auction! Everything seemed to happen in the last 30 minutes. We wish to thank all who contributed whether they be vendors or bidders, both successful and not successful, as you all contributed to our best auction of the year so far. We appreciate your support as we strive to be the best we can be in the secondary market in New Zealand. There were, of course, many highlights. The highlight for me was the amount of wines we are getting from great cellars. This kind of provenance always gives buyers confidence to bid. We had two large cellars that were new to this auction – both temperature controlled. We will continue to look for these kind of cellars as we search for wines for our auctions. New Zealand was a huge highlight in this auction with many ‘cult’ wines from the likes of Felton Road, Dry River, Stonyridge, Ata Rangi, Church Road Tom, Pegasus Bay, Te Mata and Millton which all sold well. The number of magnums we had in the NZ section was enormous by normal standards and these were very well received by our bidders. 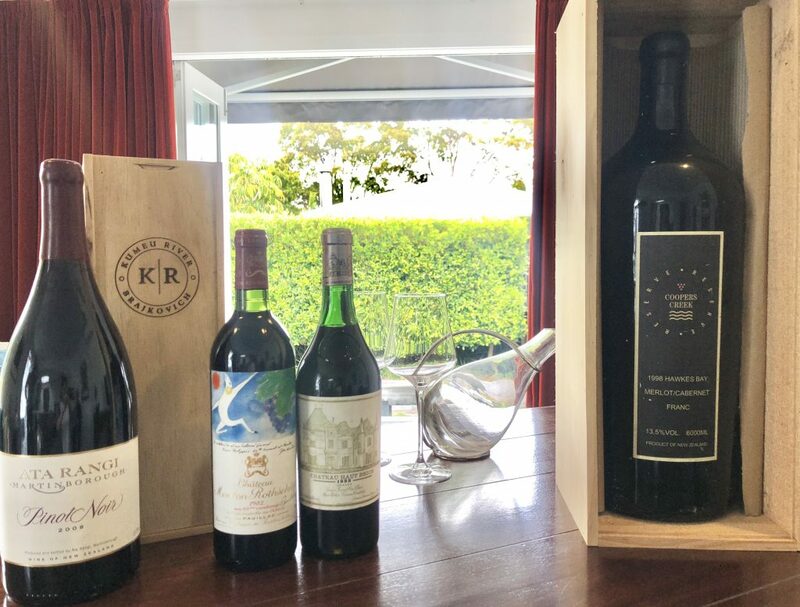 There were many wines from the fantastic 1998 vintage that pushed up past their High Estimates including a lot of Te Mata Coleraine that reached $210 and was above the High Estimate. The successful bidder on this wine would have been happy to go considerably higher than his winning bid. It was interesting to see that a lot of this wine sold for the same price at one of our fellow wine auction houses in their recent auction. Has the 1998 Te Mata Coleraine found its new level price wise? The Australian wines had a standout with the sale of the very rare 2004 Penfolds Bin 60A finding a new home. We are blessed to have another bottle of this that will appear in future auctions. In the Italian section we were very well supplied with the fabulous wines from Gaja and many of these wines sold post auction. This was very pleasing as they are are world class wines and arguably the best expression from their region on a year in, year out basis. Champagne had several magnums from the likes of Dom Perignon and Louis Roederer Cristal covering many vintages that had many bids including some from out of New Zealand. Sauternes also went exceptionally well. We had a great selection covering many brands and vintages. I believe Sauternes represents great value as it has been on a decline in the secondary market around the world for a few years but has a good following here in New Zealand as bidders, including myself, seem to enjoy these wines. The red Bordeaux section again had a wonderful selection of wines with many First Growths on offer as well as some highly desirable vintages including 1982, 1985 and 1990 were wines that sold well. An absolute highlight was a lot of 1982 Chateau Mouton Rothschild that sold for over 50% above its Reserve. Again, our sincere thanks to all vendors and all bidders for your contributions to this auction. We love finding new homes for the wines we that are consigned with us and enjoy hearing the stories from successful bidders as they enjoy the wines that they successfully bid on.